What’s it’s like to shoot a 4-gauge shotgun? And what’s the story behind these guns? Find out in this video featuring big-bore enthusiast Nick Horton at The Gun Shop in the UK. These shoulder-fired 4-bore shotguns shoot case up to 4.25″ long and pushing up to 4 1/2 oz of lead, and they can knock down game out to100 yards capable. Like lightweight guns? Then you’ll hate this 4 gauge. At 21 lbs 4 oz., it weighs more than 3 Browning Superlights, and with its 4″, 4-bore chambers, it pushes out more lead, too. Back in the 19th century, short barreled shotgun/rifles like this were used on the largest of large land mammals. They were essentially shotguns with rifled barrels. With it’s massive size, this one is more cannon than gun. It fires two shotgun-style shells, each stuffed with a single, ping-pong sized lead ball. That’s almost enough umph! to stop a train, and also why the thing is so heavy. Even at 20+lbs, I bet the recoil is more vicious than the animal you would be shooting at. This particular one was made for an bigwig in India. Indian nobleman used to buy crates of shotguns and rifles from the major British makers. Who knows what this one saw or who hands touched it? We do know that James D. Julia Auctioneers sold it October, 2015, for $149,500. For a 130-year old gun, that’s a very princely sum. 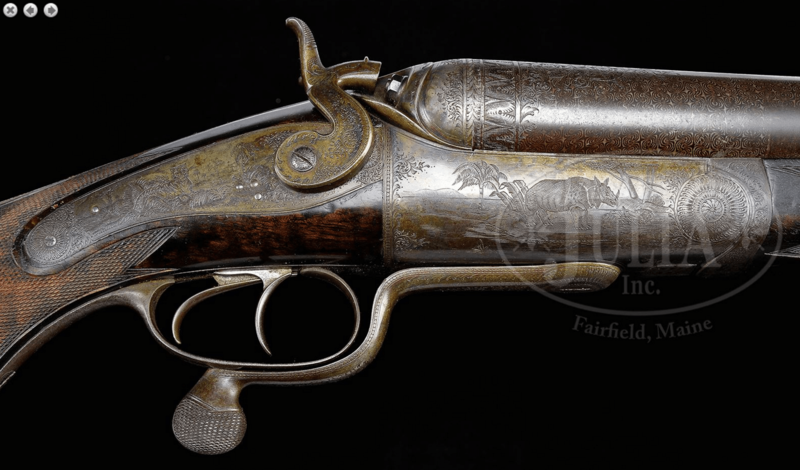 HUMONGOUS HOLLAND & HOLLAND FOUR BORE DOUBLE ELEPHANT RIFLE. SN 8336.: Cal. 4 bore. (.955 Groove diameter, 11 groove Enfield type rifling) 4″ Chambers. 24″ Fine Damascus bbls, swamped at center with slight flare toward muzzles, are fitted with full length flat rib with dolls head extension. Rear portion behind single standing leaf express rear sight marked for 50 yards, is file cut. Central portion of rib is engraved “Presented to Mirza Toffal Ali Beg Khan Bahadur by Nawab Salar Jung Mukhtar-ul Mulk, Prime Minister of Hyderabad, Ootagamund, June 15, 1885”. Silver bead front sight is longitudinally dovetailed into rib. Top of right bbl is engraved with H&H New Bond street address. Top of left is engraved “Winners of All the “Field” Rifle Trials London 1883″. Breech ends are engraved with wide acanthus bands behind 2-3/8″ triangles of exceptionally well cut scrolling acanthus with floral centers. Matching bands are at muzzles. Gun is numbered “2” on top of dolls head extension, top tang, and on forend iron. Bbl flats are stamped with London black powder proofs for 6 bore. SNs are stamped on bottoms of bbls. A large sling eye is soldered to bottom rib. 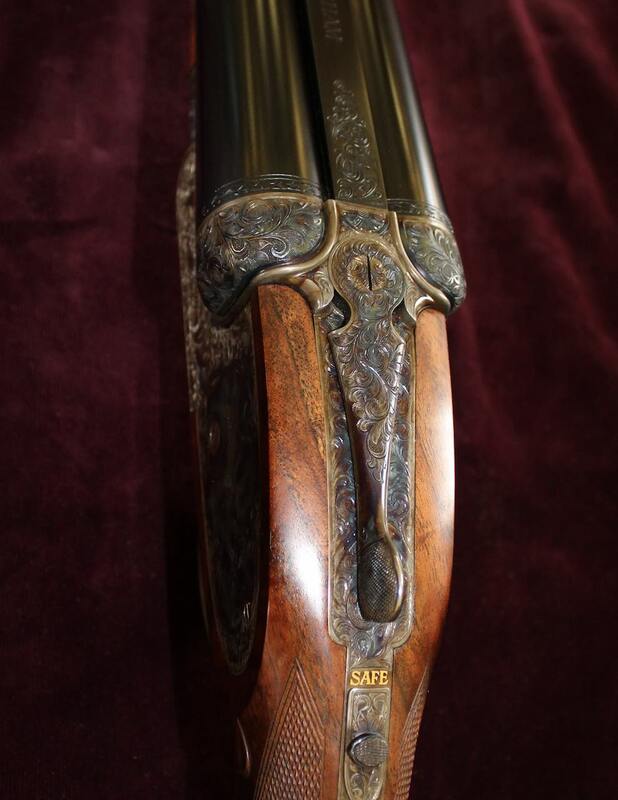 Massive case hardened Jones underlever round bar action (almost 3-1/2″ across breech face) has nicely filed fences, and is fitted with rebounding back action locks by Brazier sporting large, flat bodied, serpentine hammers with dolphin heads. Top tang extends over comb. 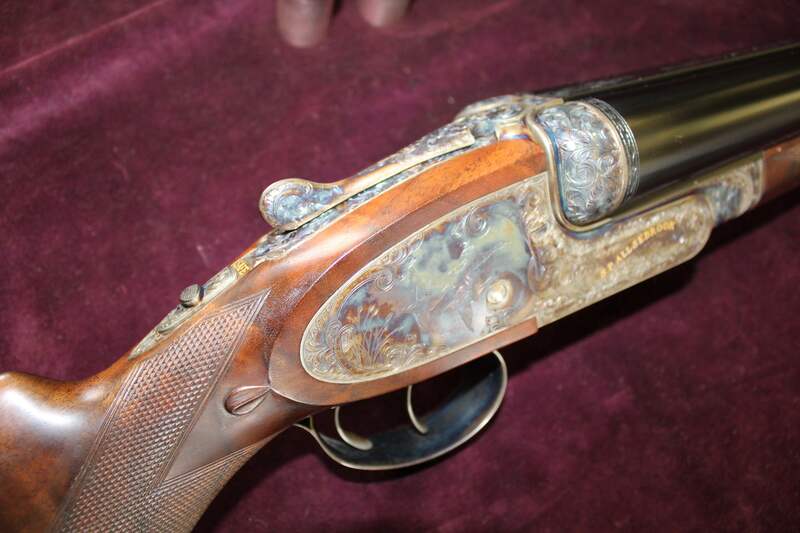 Action and locks are engraved with 30% coverage well cut sprays of scroll, as background and accent to very well rendered scenes of big game animals, many for which this rifle would be suited. Right side of action depicts a rhinoceros with large deciduous and palm trees in background. Left side depicts an elephant strolling through open savannah with some trees and mountain in background. A bear in similar background is on left lockplate, and a well limned tiger burns bright from the right. A fine portrait of a lion is on top of action between hammers. SN and “2” are on trigger guard tang which extends to horn grip cap. Fiddle figured and lightly streaked dense European walnut capped pistol grip buttstock measures 14-3/8″ over Silver type pad, and features right hand shadow line cheekpiece, point pattern checkering with mullered borders at grip, and a sling eye, matching but smaller than that on bottom of bbl, on toe line. Central portion of cheekpiece has inset gold circle engraved with complex monogram including the large letters “S” and “J” intertwined with smaller letters “M” and “K” and “JUS”. (This rifle is almost identical, except for some nuances of engraving, with four bore rifle no. 8333, made for the Nizam of Hyderabad, and pictured and described on pages 67-69 in HOLLAND & HOLLAND THE ROYAL GUNMAKER by Donald Dallas. Factory records indicate that both rifles were ordered through Rogers, Rock & Co., H&H’s Indian agents. This rifle was undoubtedly part of a large shipment of big bore rifles for various Indian princes.) Matching broad splinter forend has pivoting lever release. Drop at heel: approx 3-5/16″, drop at comb: approx 2-1/4″. Weight: 21 lbs 4 oz. LOP: 14-3/8”. PROVENANCE: Copy of factory ledger page, confirming specs and stating rifle was regulated with 14 drams of powder in a spherical ball. CONDITION: Very fine. Bbls retain over 80% orig Damascus brown with some areas of further browning and discoloration with a number of light marks and dings. Action and locks retain 60 – 70% orig case hardening color with some brown staining and high edges silvered. Top of action colors are vivid, fading and turning brown along grip strap. 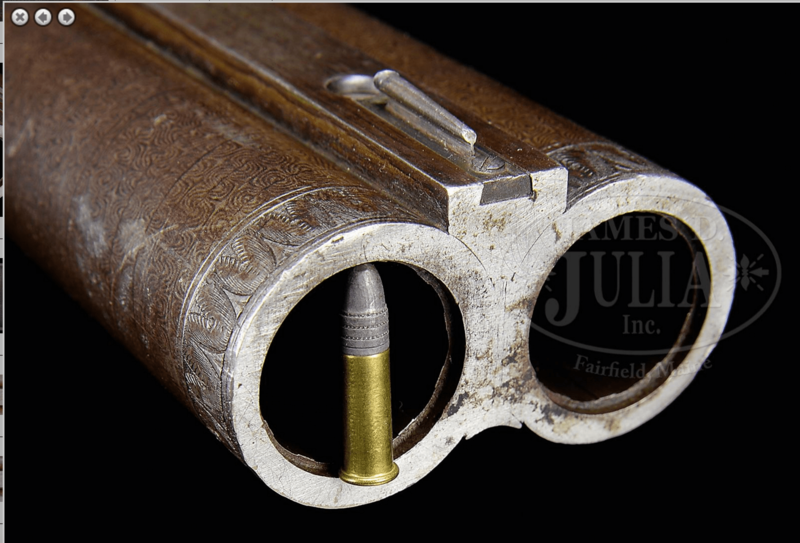 Trigger guard is essentially all gray to brown patina with traces of dark color hardening under opening lever. Stocks retain most of an old oil refinish over numerous marks and dings, both heavy and light. Sharp edges are slightly rounded. Wood is somewhat below metal at top of grip, which shows a number of well done repairs. Checkering nicely re-cut. Forend wood is fine, checkering re-cut, with a small chip at right front of bbl channel. Pad is an old replacement, fitted to orig curve, and factory specs state rifle was originally made with a “recoil buttplate”. Bores are excellent, very shiny with sharp rifling throughout, with one or two minor imperfections, most likely small flaws in Damascus. Action is tight. Bbls are on face. Locks are crisp. An exceptionally cool big bore. Estimate: $60,000-$90,000.